Weather on the day: Dry, Scatted Clouds with an Average Temperature of Approximately 20*C.
The Clyde Stride 40 mile Ultra Marathon. Race six of the Montane Scottish Ultra Marathon Series. The Clyde Stride follows the Clyde Walkway for approximately 40 miles, running in parallel with the river Clyde. It starts at Glasgow’s - Partick Railway Station following the river Clyde through Strathclyde Regional Park, the Unesco World Heritage Site at New Lanark and the Falls of Clyde Nature Reserve to finish at Bonnington Linn. All runners have a time limit of 10 hours to compete the 40 mile distance. I did it in 8:59:33 seconds. For further details of the Clyde Stride, please visit the following web site. Get Ready, Steady, 3, 2, 1 and there Off! Bothwell is Scotland's largest and finest 13th century castle. It owes its origins to Walter of Moray, a northern aristocratic family who acquired Bothwell in 1242. He (or his son William, known as ‘the Rich’) created the mighty castle in a spectacular display of feudal pride. Check point 2 - Approximately the 20 Mile mark and feeling a little dehydrated. Flattened Coco Cola and a tube of Nutella, certainly does the trick and soon pulls me around. 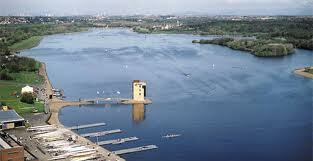 An aerial view of Strathclyde Regional Park. The 1,000 acre Country Park has attractions that make it unique in Scotland, with all the facilities of the Watersports Centre from boat & cycle hire, sailing, and leisurely walks, to the exciting M&Ds - Scotland's Theme Park. Well worth a visit. Some of the beautiful scenery that a runner will be succumbed too, while following the river Clyde. You have to be there to appreciate the beauty and tranquility that this route has to offer. Check point 3 - Approximately the 30 Mile mark, feeling good and raring to push on! The Falls of Clyde Nature Reserve, where birdsong competes with the roar of the waterfalls, keep a look out for kingfishers, otters and badgers. A last minute sprint over the finishing line, with a finishing time of (8:59:33) seconds. Not the fastest time, but at least I finished within the 10 hour window. At the end of the race, I had a relaxing three hour drive back home to Sunderland in Tyne & Wear. While being dosed up with Coca Cola, Redbull and several Bananas. Two days later, when my adrenaline had finally subsided, I learned that I had suffered a severe groin injury. The moral to this story that I have learned, is not to sprint the last section over the finishing line. Although to this day, I still cannot help myself by keeping some energy at bay, for a grand finale sprint finish. It’s in the Blood!. Feeling happy that I have competed the event, but I know that I could of carried on for at least another 10 -15 miles. Meet the team starting from left to right, Dave, Shaun, Bill, Andrea and Myself. I hope to fit this race in again next year, so why dont you!